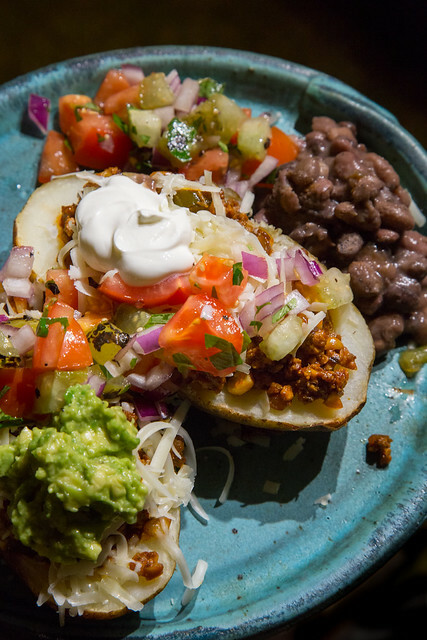 Yeah, we combined two of the best things :: tacos & baked potatoes. And we’re telling you this so you can also do great things in the kitchen. No matter what you’ve done or haven’t done, no matter what is acceptable or taboo, no matter what your experience level is, the kitchen is a place where cultures collide and combine to make things of beauty. Use your own strengths and those of others to create dishes that will nourish your body and soul. I’ve made it multiple times and mostly followed the directions each time and it’s been delicious every time. And so easy. All you need is two hours and 30 minutes and you can have yourself a delicious loaf of bread. Combine flour, salt, and yeast in the bowl of an electric mixer. Add water and oil. Mix together into a sticky dough add your olives if you’re using them then knead until dough is very elastic and smooth. The author recommends using the dough hook attachment and your mixer to knead the dough rather than kneading it by hand as the dough is extremely sticky. Once the dough is smooth and elastic, coat with olive oil and let rise in a warm place until it’s tripled in size ~ up to 1 hour. After your dough has ballooned up, thoroughly oil a deep sided baking pan. Roll the dough into the pan trying to deflate it as little as possible. Pull out the sides gently into a rough rectangle. Let dough rise until doubled in size ~ up to 1 hour. Preheat oven to 475°F. Dip your fingers in flour and poke holes over entire loaf, be sure to poke all the way to the bottom of the pan. Bake for 25 to 30 minutes until golden brown and crispy, remove and let cool in the pan. 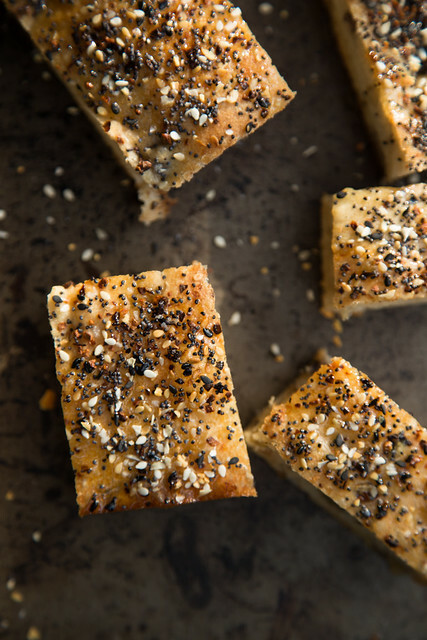 As far as toppings go, after you remove the bread from the oven you can simply paint the top with olive oil and sprinkle with Mediterranean or Chimayo or Everything ~ the choice is yours, let your imagination guide you. For the picture above I sprinkled on Everything before baking and then drizzled on olive oil and more of the blend after the bake as well!